Alicia Keys bares all, but it’s not what you think! Alicia Keys took an unusual step this week. It’s one that could have more stars following her bold move by removing all for the cameras. Now before you get to excited and start googling the photo. I’m talking about makeup. 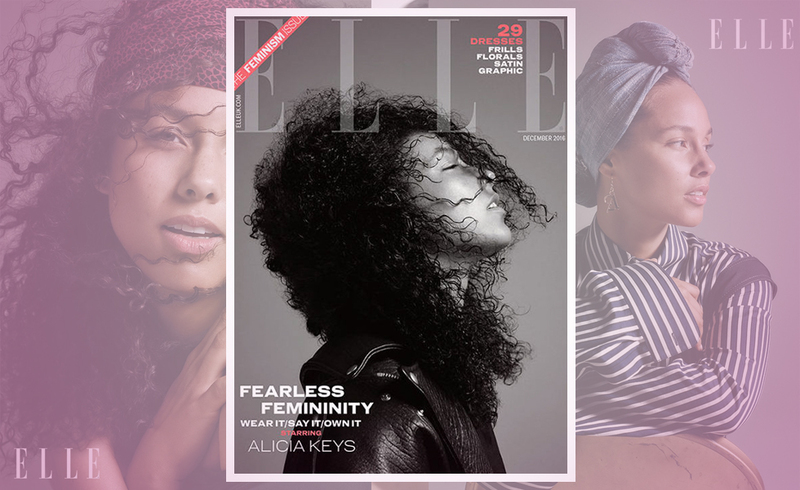 She appeared on the cover of “Elle” with her beautiful black curls and perfect skin with no makeup. She was reported as saying: “It took me forever to get this skin.” And Alicia, it was worth every moment of it. Wouldn’t it be wonderful if women across the world learned that their skin is beautiful, and can be beautiful and that perhaps treating skin is better than covering it? To Alicia Keys What a wonderful message to send out to young girls who will be watching your example. A message, they can and are beautiful without layers of makeup. There is nothing worse than seeing a young teen plastered with layers of makeup blocking every pore in her young skin from breathing or functioning to its natural capacity. It’s normally followed by years of skin problems, which then must be treated with even more products. Somewhere back in time, we created this model, and it has stuck ever since. But it’s refreshing to see someone like you Alicia Keys, show young ladies that healthy skin is much more attractive than covered skin. Let’s throw out a few cards for you Alicia, and see where they are pointing. Here is the stress card. You need to be careful of your stress levels. There is a feeling of needing to be many things to many people, and forgetting about yourself. If someone appears to be carrying bitterness towards you or something you do, then you cannot help them. You must let them sort their own likes and dislikes out, and their jealousy betrays something they are lacking, not you. Due to your dedication to your art, your work will not be disappearing anytime soon. It is important that you do not relinquish total control of your finances to any one person or body. It is always best practice to keep your finger in the pie. This way you can relax knowing everything is balanced and settled. Once balance is restored, you can give yourself time to sit back and recharge your batteries. This card is aiming back to someone with bad blood or grievance. Something that was said cannot be unsaid. But it would appear it was the truth. If someone wants to get upset about the truth, then there is little you can do. Lies are not an option. Always being true to yourself and your moral code first. When this is the way you approach the world, you will never see the need to explain anything to anyone. It’s time to look inwards. The makeup-free photo is liberating, and there is a feeling from it of needing to unwind and take a step back. Not to stop working, but to reconnect with something of the past. What you did without knowing, is showed young girls that natural skin is beautiful. This will come as a relief to those who may not like wearing makeup. And may save them problems years down the line. The cards showed some stress, and a need to look at the valuable things in life. It’s possible in the new year 2017, that property features highly. There appears to be a time of connecting your soul to an old building and rebuilding it. Previous ArticleRose McGowan, the frozen embryos and the new guy!Next ArticleHave Patrick Dempsey and wife Jillian reconciled?